Three large wildfires are currently impacting California, causing thousands of residents to evacuate. A fire perimeter map is available for the Camp wildfire, in Butte County. 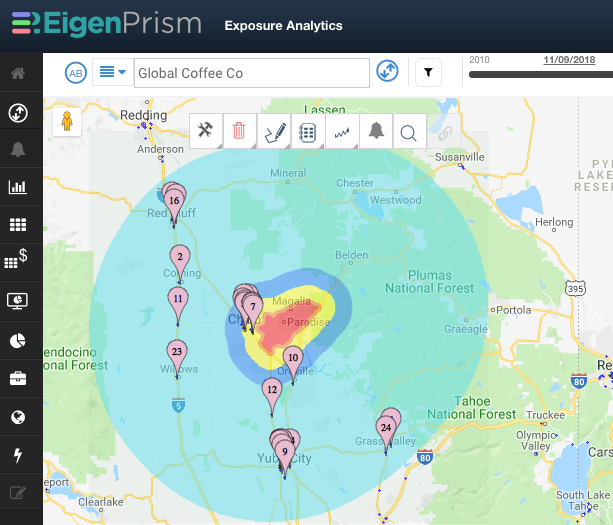 For the Hill and Woolsey fires, perimeter maps are not yet available; however, fire detection data can be accessed as a Web Map Services (WMS) layer in EigenPrism. A template Impact Report has been provided for all EigenPrism subscribers, containing an overview of all active wildfires in California for which perimeters are available, followed by the wildfire proximity maps for the Camp, Woolsey and Hill fires (as only the Camp fire perimeter is currently available, the Woolsey and Hill data will appear once the perimeters are available). Subscribers who have set Wildfire Alerts will receive email and text notifications detailing the estimated impact on their exposures as perimeters become available.